We are distributors for many of the top washroom equipment manufacturers, including ASI, All American, Baldwin, Bobrick, Bradley, Emtek, Flush Metal, Gamco, Ginger, Hewi, and Koala. Buy direct from the factory and save. Bathroom Accessories, grab bars, shower seats, safety rails and baby changing stations, are but a few of the ADA (Americans with Disabilities Act) approved washroom accessories we offer. Builders, contractors, home remodelers and do-it-yourselfers are all welcome. 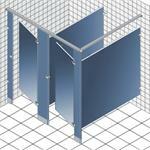 These are ideal for schools, libraries, stadiums, restaurants, malls, and other public spaces.